HMO, PPO, Or POS? How To Determine Which Plan Is Right For You. Are you faced with making a decision about what group health plan to select from your employer? You may have a choice of selecting any of the three managed care plans- an HMO, PPO, or POS. While all of these plans provide comprehensive medical care coverage, each there are differentiating factors in each of these plans as well. Before you make a decision on your health care plan, you’ll want to be acquainted with the offerings of each one. The plan that you elect should be based on your individual needs, health profiles and financial considerations. A Health Management Organization (HMO) is a system that provides comprehensive medical care on a prepaid basis to volunteer enrollees in a specified geographic area. HMOs emphasize preventative care and healthy lifestyles. The HMO offers coverage through salaried physicians and staff and/or contracted physicians, hospitals and other medical professionals. Members (patients) are required to obtain care from providers who are affiliated with the HMO. Many HMOs operate in a relatively limited geographic area, such as a metropolitan area. Should you need treatment outside of the HMO's specified location area, it would be provided on an emergency basis only. HMOs offer care for a flat monthly rate typically without deductibles or coinsurance. In other types of plans, a monthly premium is paid, but all providers are paid for as services are provided. The HMO pays the providers directly and, in some cases, the providers may collect a small copayment for office visits. An HMO emphasizes preventative care and physicians have no incentives to prescribe "excessive" tests or treatments. In some cases, physicians and other medical professionals may receive bonuses if an HMO facility operates on a cost-efficient basis. There has also been an emphasis to reduce costs by performing certain procedures on an outpatient basis vs. admitting the patient to a hospital. Historically, HMOs have assigned each member a "gatekeeper," who is typically a primary care physician or possibly a staff member. More recently, some HMOs allow members to contact network specialists directly. This gatekeeper coordinates the care of the insured and decides when and if the insured should visit a specialist, be admitted to a hospital, etc. PPACA requires that the subscriber is allowed to select their gatekeeper. HMOs emphasize preventative care that typically includes full coverage for immunizations and routine physicals. All plan providers deal directly with the HMO for payment when they perform contracted services. In many situations, the HMO employs the provider so no claims procedure is necessary. HMOs pay outsourced providers in a variety of negotiated methods. Preferred provider organizations are similar to a traditional major medical plan except that a PPO contracts with a wide range of medical care "preferred providers" to obtain lower costs. The providers are typically paid on a fee-for-service basis. Each state regulates the PPOs and insurance companies own most PPOs. A PPO's benefit structure is very similar to a traditional major medical plan. There is a network of preferred providers of physicians, hospitals, etc., but the insureds have the option of going outside the network to receive care. However, if the insured goes outside the network, the insured should expect higher out-of-pocket expenses. A PPO will often require approval from the PPO prior to hospitalization treatment, outpatient procedures, etc. The insured will again pay a fixed monthly premium as a member of the PPO. In addition, copayments, coinsurance, and deductibles are the norm. If the insured goes to a provider outside of the network, the coinsurance and possibly co-pays and deductibles will be higher than for treatment within the approved list of healthcare providers. In recent years, PPOs have been increasing preventative care services, but they are not generally as comprehensive as the HMO plans. are out-of-network, the insured may be responsible for filing the claim, although the provider may obtain authorization from the insured to file the claim directly. A Point-of-Service Plan (POS) is a hybrid of an HMO and a PPO. The most common type of POS is an "open-ended HMO," which allows HMO members to go outside the HMO network and be subject to a higher coinsurance percentage. The less common POS is a "gatekeeper PPO," which operates like a PPO, including the use of non-network providers by members, but a primary care physician serves as a gatekeeper. In either type of POS plan, the insureds have the option of going outside the network to receive care. However, if the insured goes outside the network, the insured should expect higher out-of-pocket expenses. A gatekeeper may restrict access to specialists outside of the plan. A POS plan will often require approval from the PPO prior to hospitalization treatment, outpatient procedures, etc. As a combination of HMOs and PPOs, POS providers also charge a monthly premium to their members, as well as small copayments when visiting network physicians. Deductibles may apply, depending on the specific plan. Coinsurance could apply for out-of-network providers. It is likely that the POS will include some preventative care services, but will vary by type of POS plan. If network providers provide services, the providers will file claims with the PPO. If providers are out-of-network, the insured may be responsible for filing the claim, although the provider may obtain authorization from the insured to file the claim directly. 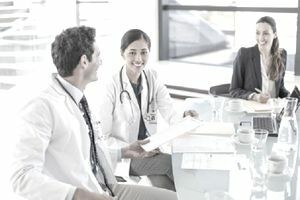 While COBRA doesn’t fit into the managed health care plans, for those people who experience a “qualifying event,” COBRA, the Consolidated Omnibus Budget Reconciliation Act of 1985, will allow employees and specified dependents the option of continuing the same group medical expense insurance, without proof of insurability, for up to 36 months. Termination of employment, except for gross misconduct (18 months). Reduction in the employee’s work hours to such an extent that he or she is no longer eligible for coverage. The loss of coverage by a dependent because of the employee’s health, divorce, legal separation, or eligibility for Medicare. The plan administrator is required to notify all eligible beneficiaries within 14 days of knowledge of qualifying event. The employer has 30 days to notify the administrator when a qualifying event occurs. The election period for COBRA starts on the dates of the qualifying event and must last at least 60 days from the time the beneficiary receives notification the administrator. Are you contemplating what kind of group medical coverage to elect? Be sure to do your homework and understand what's included in each plan.